A thorough new analysis (Ruta et al., 2003a, b) confirms aspects of both views (see cladogram). Temnospondyls lie on the line to lissamphibians, as discovered by Panchen and Smithson (1988), and the Lepospondyli is indeed a valid clade and lies on the amniote line, as argued by Laurin (1998) and Anderson (2001). But the lissamphibians return to the temnospondyl side, and are not grouped with the lepospondyls, as Laurin (1998) and others have argued. From the base, there are some stem-group taxa (Crassigyrinidae, Whatcheeriidae, Baphetidae), and then a major split into a batrachomorph clade, or the 'true' amphibians, and a reptiliomorph clade, or those tetrapods on the line to the amniotes. The Batrachomorpha have a shallow skull and a fused skull roof with no kinesis with the cheek. Batrachomorphs have only four fingers in the hand, representing the permanent loss of one finger. Temnospondyls, as classically defined, are a para-phyletic group, forming a series of outgroups to Lissamphibia. 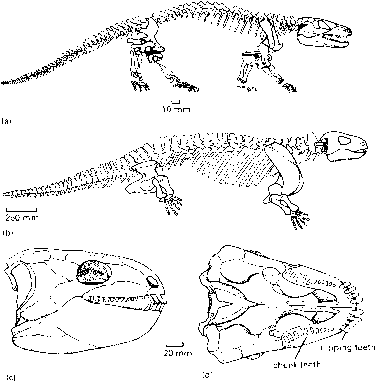 The other line consists of lepospondyls (microsaurs, nectrideans and aistopods) and reptiliomorphs. 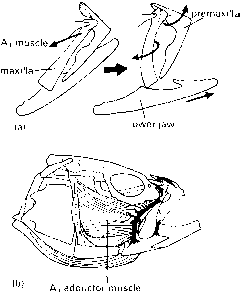 The Reptiliomorpha are characterized by changes in the snout region and in the foot. The paraphyletic 'anthracosaurs', the seymouriamorphs and the diadectomorphs form successively closer outgroups to the Amniota (= reptiles + birds + mammals). For more information, go to http://tolweb.org/tree?group=Terrestrial_Vertebrates&contgroup=Sarcopterygii, where a series of pages take you through an alternative cladogram of basal tetrapods, based on the work of Laurin (1998). Do not be confused by his rather heterodox use of group names such as 'Amphibia, 'Anthracosauria' and 'Tetrapoda'. Cladogram showing the relationships of the major groups of basal tetrapods, based on Ruta et al. (2003a), with divisions of 'Temnospondyli' from Yates and Warren (2000). 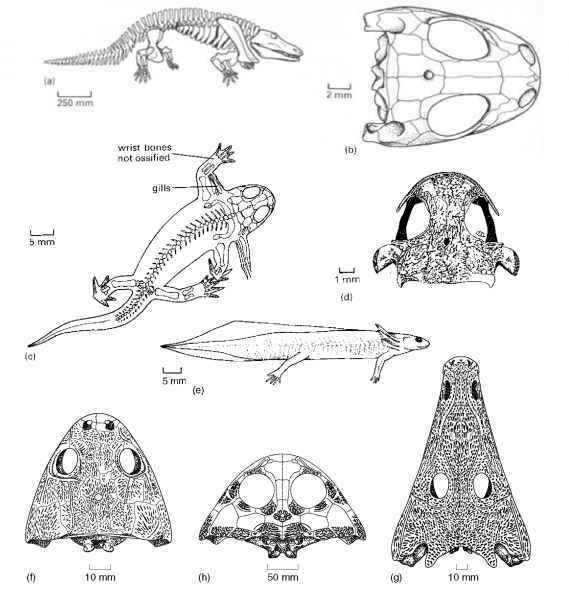 Only a small selection of temnospondyl families is shown. See Box 4.1 for context of Devonian tetrapods; see Box 5.1 for relationships of Amniota. Synapomorphies include: A, five or fewer digits; B, orbits neither round nor elliptical, tabular does not contact squamosal, large scapular blade; C, anterior palatal vacuity absent, humerus shorter than the length of two and a half mid-trunk vertebrae; D, occipital condyles present, notochord excluded from braincase in adult, ectepicondylar foramen in humerus absent; E, lateral line system on skull roof absent, mandibular canal absent, ventral humeral ridge absent; F, exposure of posterior coronoid in lateral view, entepicondylar foramen absent; GBATRACHOMORPHA, parasymphysial plate absent, radius approximately as long as ulna, no more than four digits in hand; H LIMNARCHIA, ectopterygoid tooth row, maxilla sutures with vomer, denticles on vomers absent, interclavicle elongated; I, double occipital condyles with no contribution from basioccipital, denticle field on all three coronoids absent, tooth row on posterior coronoid; J EUSKELIA, postparietals wide, large plate-like septomaxilla, short posterior skull table, intertemporal absent, basicranial articulation fused and immobile, fewer than 23 presacral vertebrae, entepicondylar foramen absent; K, maxilla enters orbit margin, narrow interorbital bar, longest trunk ribs poorly ossified short rods, slender and elongate humerus; L, skull table very short, ectopterygoid reduced or absent, palatine poorly ossified, palatine without fangs, reduced interclavicle; M LISSAMPHIBIA, pedicellate teeth, teeth bicuspid or multicuspid, supratemporal absent, tabular absent, pineal foramen absent, two coronoids absent; N, postorbital absent, postfrontal absent, coronoids absent, splenials absent, surangular absent; OBATRACHIA, jugal absent, ossified opercular bone in oval window of middle ear, fewer than 20 presacral vertebrae, pubis unossified; P, premaxillae less than two-thirds of skull width, parietal-tabular contact, vomers elongate and strip-like, tarsus with L-shaped proximal element; Q LEPOSPONDYLI, supratemporal absent, stapedial foramen absent, vertebrae consist of cylindrical pleurocentra only, neural arches and centra fuse indistinguishably early in ontogeny, atlantal intercentrum absent; R HOLOSPONDYLI, prefrontal less than three times as long as wide, ectopterygoid with tooth row, extra articulations above zygapophyses in at least some trunk and caudal vertebrae, neural and haemal spines rectangular to fan-shaped in side view, haemal spines fused to caudal centra; S REPTILIOMORPHA, premaxillae less than half of skull width, vomers taper forwards, phalangeal formula of foot 2.3.4.5.4-5; T BATRACHOSAURIA, jugal enters ventral margin of skull roof, intetemporal absent, vomer lacks fang pair, palatine lacks fang pair, trunk neural spines fused to centra, neural spines swollen laterally, interclavicle wider than long, humerus with expanded proximal and distal ends; U, postparietal and tabular entirely in occiput, supraoccipital present, first coronoid absent, sacrum with two vertebrae. Permian (Figure 4.18(a)) was a 600-mm-long active terrestrial animal that lived in fair abundance in the southern midwestern USA and Germany (Berman et al., 2000b). It had powerful limbs, and the body was held higher off the ground than in most tetrapods so far considered. Aquatic seymouriamorphs from the Upper Permian of Russia, the kotlassiids, had broad skulls and fed on fishes. The discosauriscids, another seymouri-amorph group, were small, 400 mm long, terrestrial forms, known from the Upper Carboniferous to Upper Permian of Europe and Asia. The diadectomorphs, Late Carboniferous and Early Permian terrestrial forms, are reptiliomorphs, very close to the origin of the amniotes (see Box 4.5). Diadectes from the western USA and Germany (Figure 4.18(b—d)) is rather heavily built, with massive limb girdles, short limbs and heavy vertebrae and ribs (Berman et al., 1998). Its key features are, however, seen in the skull. Diadectes was one of the first terrestrial vertebrates to adopt a herbivorous diet: there are eight short peg-like teeth at the front of the jaw that were used for nipping off mouthfuls of vegetation, and rows of broad blunt cheek teeth that were used to grind it up.